President Donald Trump raised expectations for NATO member nations even higher on Wednesday in Brussels, asking them to double their defense spending to 4 percent of their varying GDPs. His demand was revealed to press by the president of Bulgaria. Trump’s White House spokeswoman Sarah Sanders then confirmed the ask to reporters, claiming that it was not a new position for the U.S. president. Just last week, Defense Secretary James Mattis wrote to the U.K. government, which meets the 2 percent watermark, and asked it to raise its contribution closer to the United States’ financial sacrifice. The U.S. president has lambasted U.S. allies for routinely failing to meet a 2 percent goal, a much lower standard that their nations agreed upon before he took office. His demand that they raise their contributions to 4 percent came as a surprise, however, during the first meeting of this week’s Brussels summit. Trump made the remarks in a closed-door session of the North Atlantic Council on Wednesday. ‘President Trump, who spoke first, raised the issue not only to achieve 2 percent, today, but a new barrier – 4 percent,’ Bulgarian President Rumen Radev told reporters, according to the wire service Reuters. Sanders claimed in a statement to press that Trump made the very same ask at convening of NATO leaders last year. She did not dispute the Bulgarian president’s version of events. ‘During the President’s remarks today at the NATO summit he suggested that countries not only meet their commitment of 2% of their GDP on defense spending, but that they increase it to 4%. The President raised this same issue when he was at NATO last year,’ the Trump spokeswoman said. In formal remarks to leaders at the 2017 summit in Brussels, Trump did not ask NATO nations to bring their defense spending up to 4 percent. He did claim in the speech that other countries ‘owe massive amounts of money from past years’ of not meeting the defense spending guidelines. ‘Over the last eight years, the United States spent more on defense than all other NATO countries combined. If all NATO members had spent just 2 percent of their GDP on defense last year, we would have had another $119 billion for our collective defense and for the financing of additional NATO reserves,’ he said. Trump said that with ‘chronic underpayments and growing threats, even 2 percent of GDP is insufficient to close the gaps in modernizing, readiness, and the size of forces. Trump has claimed on numerous occasions over the last week that the United States’ more than 4 percent GDP contribution to the security of the group compared to its European allies is ‘very unfair’ to the American taxpayer. A new NATO report actually puts the U.S. contribution at 3.5 percent of the nation’s GDP in 2018, however, because it accounts for pension payments differently. Still, the U.S. gives significantly more than the next closest country. 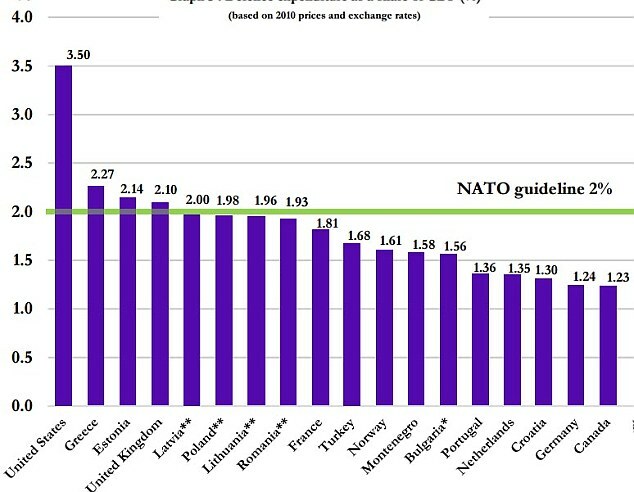 Greece puts just 2.27 percent of its GDP to NATO nations’ common defense. Germany’s spending on defense as a percentage of GDP was on par with a handful of other NATO nations at 1.24 percent, putting it at the mid-to-lower end of the pack. The acknowledgement that Trump had done the shoving came during a pre-dinner interlude in the president’s long summit day. Trump began his first and only full day in Belgium at a breakfast with NATO Secretary General Jens Stoltenberg. 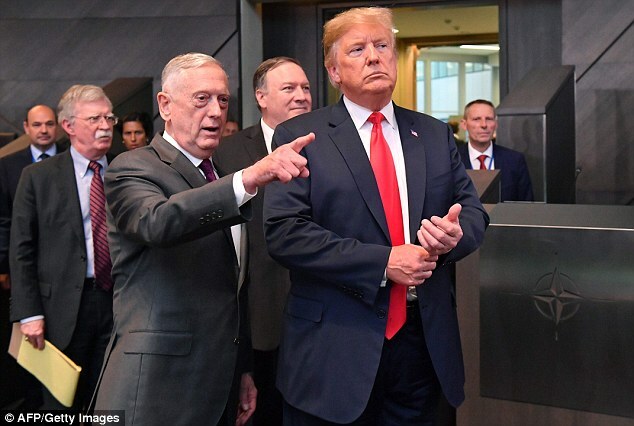 He participated in official NATO activities later, including the meeting where he made the 4 percent spending demand, at the organization’s new Brussels, Belgium headquarters. Before an evening program, Trump met with Germany’s Angela Merkel and France’s Emmanuel Macron. Tomorrow he attends meetings at NATO before departing in the afternoon for London.